$25 Walmart Gift Card + Star Wars Cereal #Giveaway CLOSED!! When I was little my dad was a huge Star Wars fan, and I had watched Star Wars too many times to count when I was younger. Then when the new movies came out starting back in 1999, I was there waiting in line to see them in the theater, then again in 2002 and 2005! Yes, I am a born Star Wars geek, I cant help it, I was raised to be one, lol. Then when they released the complete series to DVD I had to be one of the first to get it. Well recently they released the complete saga on Blu-Ray and I am hoping Santa will bring me the set since I have been a somewhat good girl this year!!! To help celebrate this release, for a limited time at your local Wal-Mart you will find specially marked boxes of General Mills cereal with the Star Wars Good vs. Evil packaging!! Exclusively at Walmart, look for specially marked boxes of Big G cereals, including Honey Nut Cheerios, Cinnamon Toast Crunch, and Lucky Charms. Collect all three to create a Star Wars panoramic poster showcasing your favorite characters, like Darth Vadar, Luke Skywalke, Han Solo, Princess Leia and more. Marking the first time ever that the full Saga is available in one complete collection, the 9-disc STAR WARS: THE COMPLETE SAGA is now avaiable, courtesy of Lucasfilm Ltd. and Twentieth Century Fox Home Entertainment. 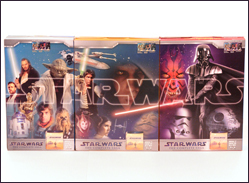 May the force be with you as you check out these Star Wars boxes at your local Walmart for a limited time only! Find more information about Big G cereals at www.WholeGrainNation.com. Find out more information about Star Wars The Complete Saga at Blu-ray.Starwars.com. One of my lucky readers will win one box of the Honey Nut Cheerios, Cinnamon Toast Crunch and one box of Lucky Charms so you can have your own Star Wars panoramic poster along with a $25 Walmart Gift Card!!! Which Star Wars movie moment and/or character is your favorite? Please leave me your email with this entry!! This giveaway is open to US residents. This giveaway will end at 11:59 pm on October 19,2011. Winner will be chosen at random.org and will be given 48 hours before another winner will be chosen. All products for reviews and giveaways are given as a sample from the companies. All opinions in reviews I conduct are my own. I was not paid to say anything or review any products. Disclosure: The cereal, gift card, information, and giveaway have been provided by General Mills through MyBlogSpark. Han Solo is my favorite character. I "like" your new Facebook page (1). I "like" your new Facebook page (2). I love the bar scene and music from the 1st movie. I entered your Petsmart giveaway. Princess Leah is my favorite. Thanks for the giveaway! Han Solo is my favorite character. Thanks for having the contest! My favorite character is Yoda! magic56331(at)gmail(dot)com. Thank you! Like your new Facebook page #1Nancy P.
Like your new Facebook page #2Nancy P.
Follow on Networked BlogsNancy P.